This gourmet thank you gift basket says thanks in a really big and tasty way. Premium confections that make a great impression. A very popular thank you gift idea. 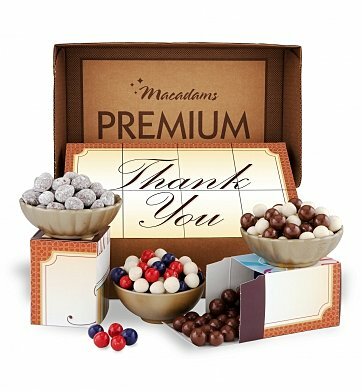 When only a gourmet thank you gift basket will do, send this incredible collection of quality Macadams' chocolate confections. Eight individual gift boxes hold Chocolate Maltballs, Cinnamon Holland Mints, Chocolate Covered Blueberries, Tiramisu Caramels, Milk Chocolate Peanuts, Chocolate Toffee Almonds, Cheesecake Caramels, and Chocolate Covered Pretzels. The perfect thank you gourmet gift basket that exceeds expectations when you also want to impress. One of our all time favorites and one of our very affordable gift baskets at the perfect price. Tasty treats make perfect thank you gift ideas. Measures 14" x 9" x 3".